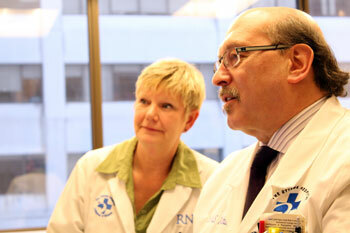 The Multiple Sclerosis Society of Canada and the Multiple Sclerosis Scientific Research Foundation announced today a $4.2 million grant to support the first Canadian clinical trial of mesenchymal stem cell therapy for multiple sclerosis (MS), led by Dr. Mark S. Freedman of The Ottawa Hospital and the University of Ottawa. Mesenchymal stem cells, which are also called mesenchymal stromal cells or MSCs, can be found in adult bone marrow, fat and skin tissue, as well as umbilical cord blood. Like other kinds of stem cells, MSCs can give rise to other more specialized types of cells, however their therapeutic potential comes more from their ability to modify the immune system, reduce inflammation and release factors that help prevent and repair tissue damage. The trial, called MESCAMS (MEsenchymal Stem cell therapy for CAnadian MS patients) will evaluate the safety and potential benefits of MSCs that have been extracted from the participant’s own bone marrow, expanded in a specialized laboratory and then infused back into the same participant. In addition to The Ottawa Hospital, MESCAMS will also be taking place at Health Sciences Centre (HSC) Winnipeg under the leadership of Dr. James J. Marriott of the University of Manitoba. MESCAMS is also part of a larger, international research effort studying MSCs, led by Dr. Freedman and Dr. A. Uccelli of Genoa, Italy. The international effort will allow scientific resources and expertise to be pooled from nine countries worldwide. This effort will also assist in developing an international consensus on safe protocols for MSC therapy. MESCAMS aims to recruit 40 patients (20 at each Canadian site), which represents 25 percent of participants in the international collaboration. The Ottawa site has received ethics and regulatory approval, and is screening patients for recruitment. Participants in MESCAMS will be randomized to two groups: one group will receive their own MSCs soon after they are extracted, expanded in the laboratory and frozen, while the other group will initially receive a mock solution, and will then receive their previously frozen MSCs 24 weeks later. Neither the researchers nor the participants will know which group the participant is in. This is done to determine if any effects observed are due to the MSCs or to a placebo effect. Margo Murchison, a former teacher in Ottawa, has been living with MS for more than 30 years. Dr. Freedman and his colleague Dr. Harry Atkins, a bone marrow transplant specialist and scientist at The Ottawa Hospital, have also pioneered a different kind of stem cell therapy for MS that uses hematopoietic stem cells (HSCs) to replace the patient’s defective immune system with a healthy new one. The procedure involves purifying and freezing HSCs from the patient’s blood, then using strong chemotherapy to completely eliminate the patient’s defective immune system. The patient then receives an infusion of their own, previously frozen HSCs, which gives rise to a new, healthy immune system that no longer attacks the brain and spinal cord. For a detailed comparison of these two kinds of stem cell therapies for MS, please see the Ottawa Hospital Research Institute’s website. People with MS who are interested in novel treatment options should speak with their neurologist. The grant announced today by the MS Society of Canada and the Multiple Sclerosis Scientific Research Foundation for MESCAMS is also supported by Research Manitoba ($1.5 million) and A&W Food Services of Canada Inc. ($1 million). The Ottawa Hospital Foundation, the Canada Foundation for Innovation and the Ontario Ministry of Research and Innovation have also provided crucial support for the specialized laboratory used to process MSCs at The Ottawa Hospital. The Ottawa Hospital Research Institute is the research arm of The Ottawa Hospital and is an affiliated institute of the University of Ottawa, closely associated with its faculties of Medicine and Health Sciences. The Ottawa Hospital Research Institute includes more than 1,700 scientists, clinical investigators, graduate students, postdoctoral fellows and staff conducting research to improve the understanding, prevention, diagnosis and treatment of human disease. Support our research. Give to the Tender Loving Research campaign. Canada has the highest rate of multiple sclerosis in the world. MS is a chronic, often disabling disease of the central nervous system comprising the brain, spinal cord and optic nerve. It is one of the most common neurological diseases affecting young adults in Canada. Most people with MS are diagnosed between the ages of 15 and 40, and the unpredictable effects of MS last for the rest of their lives. The MS Society provides services to people with MS and their families and funds research to find the cause and cure for this disease. The Multiple Sclerosis Scientific Research Foundation funds large, innovative, multi-centre collaborative studies that will lead to major advances in the field of MS. A unique Canadian resource, the Foundation’s main funding source is the MS Society of Canada. Please visit mssociety.ca or call 1-800-268-7582 to make a donation or for more information.